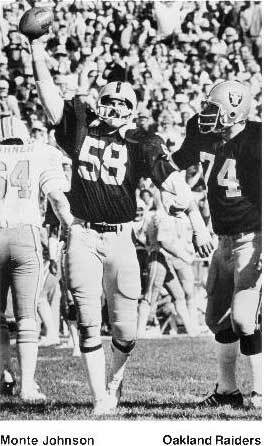 Monte Johnson was a defensive tackle on the National Championship teams in 1970 and 1971 and went on to play and win in two Super Bowls for the Oakland Raiders in 1977 and 1981. He is the only Husker with two National Championships and Super Bowls. This interview was done on June 18, 2004 by David Max. MJ I grew up in Bloomington, MN, a suburb of Minneapolis. MJ Carl Selmer. It's kind of an interesting story. Carl got a film from a school called Robinsdale High School which was in the same conference my school played. The reason why they did was because Dennis Claridge had gone to Robinsdale. Every year the coach from Robinsdale would send a game film to Carl. Somehow the name Robinsdale got scratched off the can of film and the name on the film can was Lincoln. The school that I went to was Lincoln High School in Bloomington. The film sat on Carl's desk for a number of weeks and Cletus Fischer said to Carl "What are you doing with that can of film from Lincoln High School?" He said "I don't know which one your talking about." and Cletus said "The one that's on your desk." They had no idea what it was and so they turned it on and started to watch it and they called Lincoln High School and said "whose number 78?" The coach at Lincoln High School didn't know what they were talking about so the film just sat there. A few more weeks went by and the coach from Robinsdale called Carl and asked him if he was going to send his film back to him because he wanted to send it to some other schools. Carl said "What film are you talking about?" The coach from Robinsdale said "The one that I sent down to you where Robinsdale was playing Lincoln High." Carl immediately said "whose number 78?" The coach from Robinsdale said "I thought you might notice him." He told Carl who it was and Carl contacted my coach, Rocky Elton, and the rest is history. Carl contacted me and I got invited down for a trip and it was a very positive experience. Coach Devaney came up and saw us. They brought my mother down. It was a great opportunity and it was far enough away that my parents couldn't come and get me and it was close enough that if I had to go home I could. DM Did you do any recruiting visits to any other schools? MJ Oh, yeah. I went to a number of other major schools. I got recruited by Notre Dame, the University of Washington, Iowa State and Wisconsin. I made a half dozen or more visits to different schools. Back then the recruiting rules were a lot more liberal and you weren't limited to the number of visits. You could go to as many as you wanted to. I was going somewhere about every weekend. It was a lot of fun. DM What separated Nebraska out from the rest of the crowd? MJ Integrity. The coaches. A lot of the schools that I visited said things like "You're going to be an All-American. You're going to start." etc. which I thought was a lot of smoke and mirrors. Carl and Bob basically said "Listen, we think you can contribute to our program. Whether or not you do is up to you. The one thing that we can assure you is that you will get an education. " They just seemed to be very high moral integrity individuals and I really felt that they were interested and cared. MJ Monte Kiffin. Crazy would be a pretty good description. Nah, crazy is not right. He was a very enthusiastic, highly motivated very, very capable coach. He did a great job with us. We were always very well prepared mentally and physically. We were always in better shape. He was a real good coach. DM What was the strength and conditioning like then? Was Boyd Epley there then? MJ Along with myself and John Dutton, we probably made Boyd Epley the success that he was. We were the first guys that really started the weight program. There was a guy there that was a couple of years older than we were named Dave Wallin and Dave was a real weight trainer and big into the weights as well. After our freshman year we went into the weight room because they thought it would be beneficial for us to bulk up with a little bit. John Dutton and I were roommates as freshmen. Boyd had just started coming over to get involved with the weight program. One thing led to another and by the time I was a senior Boyd was on the staff as a part of the conditioning program. Boyd was a track athlete. I think he was a pole vaulter and got injured and couldn't continue pole vaulting. Al Davis hired him to train me after I got drafted by the Raiders. MJ We were so good back then and we didn't have much competition. My junior year we were playing Kansas down in Kansas. It was the first time that season that we were losing at half time. If I remember correctly we were losing 20-0 at half time and getting beat. We came into the locker room at half time and Bob gave one of those motivational encouragement types of talk and basically said that we were a better ball club than this and the potential that you have in front of you, etc., etc. We ended up making the appropriate number of adjustments during half time and the game ended up being 40-20. The other game that obviously sticks out would be the game of the century when we played Oklahoma in '71. My major contribution in that game would have been on special teams. One game that stands out that was a defeat was my senior year against Oklahoma. Personally, I played a really good game but it was still a loss. The one thing that I remember most about that game was that our fans applauded the Oklahoma team. They weren't booing or being critical. They literally were some of the greatest fans in the world. The three years that I played we always played Minnesota and there was the opportunity of playing against guys that I played against in high school. Those are good memories. DM Do you have any game or "in the huddle" stories that you remember? MJ I remember kind of a funny thing that happened my junior year against Hawaii in Hawaii. We were beating them pretty bad and there was a fumble and I recovered the ball. There was one of the Hawaii players next to me and they were trying to pull away in the pile and so forth and the referee was yelling "It's our ball! It's our ball!" and pointing in the direction of Hawaii and gave them the ball. It was kind of funny to hear the referee yelling "It's our ball! It's our ball!" I stood up and ask him "Tell me how you were being independent?" Another funny story happened in the Army game my senior year. We won 77-7 and this was toward the end of the game. I was rushing the passer and hit him as he was letting the ball go and I looked and saw the ball bounce and end up in the hands of the receiver and the referees called it a catch. I turned to the referee and said "Does one bounce count the same as in the air here at Army?" He looked at me and smiled and walked away 'cause at that particular point in time we were defeating them so badly it didn't matter. I was tempted to ask him if he was an Army grad. MJ I remember my freshman year Bob came down and talked to the freshmen. Back then we had freshmen teams. Jim Ross was our coach. We practiced and scrimmaged all by ourselves. We never played against the varsity. He came down one day toward the first part of the season and he was talking about reading newspaper clipping and if you had a tendency to read all of those you might think you were better than you were. The story that he told was that when you're in the woods and you've got to do your business you know what newspaper clippings are good for don't you? Of course we all laughed and understood what he was talking about. MJ Being on defense nothing comes to mind from when I was playing. I got to know Tom a lot better when I was playing in the pros and lived in Lincoln during the off season. I would go see Tom whenever we would travel back to Lincoln and we would visit. He was always very gracious and very kind and we would talk and he always wanted to know how I was doing and that he appreciated how I was not only representing myself but also the University with my play in pro ball. He is just a great man besides being a great coach. MJ I remember when we were playing Alabama in the Orange Bowl I think it was the first or second punt return and they punted the ball to Johnny. Johnny ran it back for a touchdown down the Alabama sideline right in front of the coach Bear Bryant. I remember seeing him as I was running along trying to make a block to continue to let Johnny run and make the touchdown and seeing Bear Bryant shaking his head. You couldn't tell what he was saying but you could certainly tell that he was not positive about what was happening and that he knew it was going to be a long day. I think about the play in which the fumble took place with Bobby and Bill and Larry Jacobson. That was a huge play. Another play that sticks out was, I think it was also during the Alabama game when Willie Harper took the ball away from the Alabama player in mid air. DM What was it like going from Lincoln to playing for the Raiders? MJ Oh, man! It was like the boy who had never left the farm and went to the big city. It was a BIG change. We were so used to the discipline and following the leadership of the coaches. It was a "Yes, sir." and "No, sir." and "Where, sir" kind of a response. Then all of a sudden you're hearing players yelling at coaches and screaming at the owner and calling them names. Especially the Raiders. It was a rag tag crew. They were the misfits of the NFL. It was amazing. John Madden did such a great job of allowing individuals to take their personal issues that would have not been understood or even tolerated by other teams and let them goof around from Monday through Saturday but as long as they showed up an performed on Sunday that was what he was interested in. In fact, he made that comment. "I'm interested in what you do Monday through Saturday but I care greatly what you do on Sunday." DM You and Dave Humm played at Nebraska and with the Raiders. What are your memories of Dave? MJ I thought Dave was a very talented quarterback. He was a sophomore my senior year. I really felt he was very, very talented. It became obvious at the pro level that his weakness was his strength. He hung in there. He was very intelligent. I think that's what really helped him and why he hung on so long with the Raiders was his intelligence. What he lacked in physical he made up with his ability to read defenses. DM What was it like playing for John Madden? MJ It was a great experience. John was very much of a players coach. I'll tell you a story. After we beat Minnesota in the Super Bowl in 1977 I went back home to Nebraska. I lived in Lincoln during the off season and this was the following March. It was early in the morning and the phone rang and it was John. This had to be about six o'clock in the morning out in California and the first thing that came to my mind was that I was traded. I said "John, what in the world are you doing?" He said "Well, I'm just sitting here watching the Super Bowl over again and I just wanted to call you and tell you how much I recognize what was your major contribution in that game. In fact, there was a play that I think was the turning point of the game. Can you remember what that play might be?" There was a play that stuck out in my head. It was just after half and it was a running play and they had pulled their guard and I shot the gap and tackled the running back for a loss which put them into a passing situation. The next play we intercepted the ball. I said "John, I'm thinking about that play." He said "That's the play that I was thinking about. That was a great read and a great play. I think it was the turning point of the game and just want to tell you I really appreciate it." DM Other than that play what was your favorite Super Bowl memory? MJ In the same Super Bowl against Minnesota in the first quarter they kicked off to us and held us. We were three downs and out and were going to punt the ball. Ray Guy was in punt formation and Minnesota blocked the punt. Ray Guy recovered it but he was tackled on about the 2 1/2 yard line. Our first series on downs on defense was against our goal line. In preparation for the games one of the things that the coaches let me do is contribute to the game plan as the middle linebacker and the one who calls all the defensive plays in the huddle. In preparation for that game I had discovered what I thought was a tendency that Minnesota had not only in a goal line but in short yardage situations. They cheated their backs and when they lined up in a certain way they ran that direction and when they cheated them a different way they ran them the other way. We sat down and looked at a number of reels of film and the coaches said "Yeah, I think you're right." What I asked them to let me do was let me call the goal line and short yardage defenses from the line of scrimmage and they agreed. Basically the defense was check with me on the ball. Tarkenton comes out and was calling out the signals and I read the back field and slanted our line in the direction that they were going to be running the ball. The first play we hit them in the back field and they lost a yard. So now it's second and 3 1/2 for the touchdown. They came out again and I read it and slanted the line the other way. They blew the blocking scheme by the way we were slanting because they thought we were going to be in a different defense because in the past we had always done something different in that particular formation. They lined themselves and we slanted in a way which normally we would have not done. Phil Villapiano came free and he hit the running back and Tarkenton at the same time and caused a fumble which Willie Hall recovered on the 2 yard line. Our offense came on the field and drove 98 yards for the first touchdown and Minnesota never got back into the game. Reading those plays and making those calls and the confidence that the coaches had in me was one of the biggest memories about that game. MJ Yes I do. Jeff Kinney is who I have maintained the strongest and closest relationship over the years. I've been back for some of the various events and see people and the friendships just pick up right where they left off. One of the guys that played in the 60's and is probably one of my closest friends is a former Husker named Dave Sundberg. His son Craig was one of the quarterbacks in the 80's. MJ I've told people that if you stick me the the front I bleed red and if you stick me in the back I bleed black. Because of the wonderful opportunity that the University gave to me I will be eternally grateful for the privilege of representing them. It was a wonderful experience. We were 32-2-2 the three years that I played. Two National Championships, three Big 8 Championships and three consecutive Orange Bowls. It was a wonderful experience. I got a chance to get exposed and get drafted by the Raiders and play eight years in the NFL and two Super Bowl Championship teams. I'm a very blessed person and very, very fortunate. God has been really good to me. I'm sitting here looking at my helmet when I played and an autographed football of my teammates. Just great, great, great memories. DM How would you compare playing in the Super Bowl vs. playing in a National Championship game? MJ The Super Bowl is a litte bigger. (Laughs) I would say that for me the game of the century against Oklahoma was much bigger than the National Championship games. We were pretty darn confident that we were going to win those games. The Super Bowl in the Rose Bowl with 106,000 people against Minnesota and millions of people around the world and for three hours they're watching you as 1 of 22 players having to make the plays was just a great experience. MJ I have my own business. I am a financial advisor to high net worth families with multiple generations and help them coordinate their financial affairs. I've been doing that since I retired from football. DM Monte, thanks for sharing your Husker memories with us. This series of interviews is being done in conjunction with the Bob Terrio Classic on July 15th. Monte Johnson can be reached at this email.